It’s the little things, the continuing sequence of unspeakable episodes which inside Germany most people don`t seem to mind and outside Germany hardly anybody will ever notice. That`s why I`m telling. For example the attempted ban of Anti-Nazi stickers just recently. A local court ruled that stickers showing a cancelled Hakenkreuz or somebody throwing a Hakenkreuz into the trash bin were in fact illegal as they are showing Nazi symbols. This was not a joke - and it went on. Inspired by this decision - and before a higher court eventually scrapped it - judges in Tübingen and München ruled alike. Attendants to political events were arrested for wearing obviously antifascist stickers. 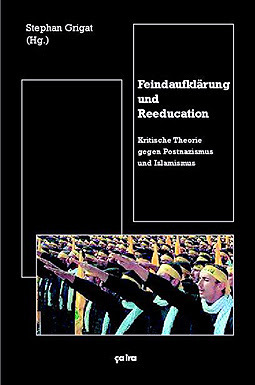 A book was almost put on the index because it showed members of Hizbollah presenting the “German salute” - right underneath the title line: “Critical Theory against Post-Nazism and Islamism”. These rulings were overtly directed against antifascists - the antifascists were directly blamed for keeping these symbols alive. And then, having taken a deep breath as thanks to decades of Western occupation none of these decisions could stand an appeal, then you find out that the same prosecutor`s office is dealing with an SS massacre in World War II where they just can`t find any real evidence for cruelty or base motives. On August 12, 1944, the soldiers had poured gas on children and set them on fire. You are currently browsing the Discordian Communism blog archives for April, 2007.